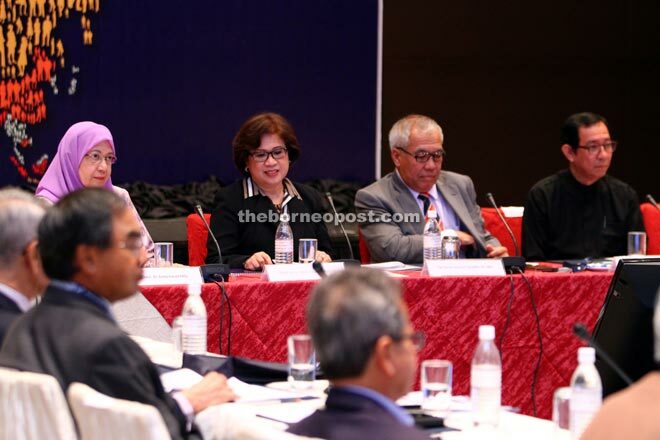 KUCHING: Global research and development (R&D) leaders, business leaders and policy makers must work together and use science, technology and innovation (STI) to help the ‘bottom billion’, said Minister of Science, Technology and Innovation Datuk Wilfred Madius Tangau. According to the World Bank, the ‘bottom billion’ refers to the 1.4 billion underprivileged people in the world who earn less than US$1.25 a day and are marginalised. In Malaysia, the government was giving special attention to a similar underprivileged group known as the ‘B40’. It refers to people in the bottom 40 per cent of Malaysian households who earn less than RM3,000 monthly (averaging about US$6.50 per person per day. “To help the B40, the government launched the New Economic Model (NEM) in 2009 and recently the 11th Malaysia Plan for the year 2016-2020 that was themed ‘Anchoring Growth of People’. “The aim is to have a country where everyone, regardless of gender, ethnicity and socio-economic status, enjoy prosperity and good quality of life,” he said at the launching of the Global R&D Leaders and CEOs Forum 2015 themed ‘Injecting Soul into R&D’ here yesterday. His text of speech was read by Ministry of Science, Technology and Innovation (Mosti) secretary-general Datuk Seri Dr Noorul Ainur Mohd Nur. Wilfred said there ought to be concerted effort to forge mission-oriented R&D that can generate solutions for the challenges faced by the bottom billion. “We need to get our priorities right, be purposeful, and come up with value-based solutions that can help the masses. Wilfred said innovative technologies must be made affordable and accessible to all, and entrepreneurial skills must be used to solve social problems, change revenue-based mindsets, and build lasting solutions for everyone. Meanwhile, Academy of Sciences Malaysia president Tan Sri Dr Ahmad Tajuddin Ali, who was also present, opined that issues such as poverty, literacy, malnutrition and access to healthcare plaguing the bottom billion of the world’s population could not be resolved with a profit-driven mindset. He noted that when people talked about science, technology and innovation (STI) and research and development (R&D) nowadays, they were very much focussed on ways to make money out of breakthroughs in STI. “We need to make advancements in STI accessible to all. For example, in the treatment of cancer, science has provided adequate treatment facility to treat cancer patients, but at this juncture, the ‘bottom billion’ does not have enough means to gain access to the treatment. Among those present at the launching were Academy of Sciences Malaysia (ASM) Fellow and International Association of Universities president Prof Tan Sri Dzulkifli Abdul Razak and Global R&D Leaders and CEOs Forum chairperson Prof Datuk Dr Asma Ismail.